Elizabeth Wilmer, who married Gilbert Jellians in Dudley in about 1642, had a father, grandfather and great grandfather each called Thomas Wilmer. Their dates were respectively Thomas Wilmer of Staverton (1522-1580), his son Thomas Wilmer of Budbroke (1554-1628) and his son Thomas Wilmer of Dudley (1594-1680). Elizabeth Wilmer was baptized in St Edmunds Dudley on 11 Aug 1623. Two of the Thomas Wilmers married into the Sutton family, who were the Lords Dudley residing at Dudley Castle. It would be fair to say the last three members of the Sutton family to hold the title ie the third, fourth and fifth Barons showed some lack of financially astuteness, nor did they really show themselves capable of dealing with the new legal order of the Tudors and Stuarts. Land ownership was increasingly ruled by law, and justice was no longer in the hands of the local lord of the manor – on several occasions the Suttons tried to seize land by force rather than arguing their case before the law. The Suttons were either distracted by the royal court, serving in foreign wars or promoting their mistresses. By contrast, Elizabeth’s grandfather, Thomas Wilmer 1554-1628 was an Oxford educated barrister and member of Lincoln’s Inn. He pulled off a number of impressive land deals mainly at the expense of the debt-laden Sutton family. When Sir Edward Sutton fifth Baron Dudley died in 1643, the Sutton family was bankrupt and in ruins, and the estates either sold or handed to illegitimate off-spring. The titles were only preserved and debts assuaged by the marriage of the last Sir Edward’s granddaughter to the wealthy goldsmith Humble Ward. Shortly after by 1590 Thomas Wilmer married Anne Sutton, the fifth baron Sir Edward’s half sister. Although Anne must have been somewhat damaged in her reputation being the widow of the executed traitor Francis Throckmorton, she was young enough to bear Thomas two sons. The eldest son married Sir Edward’s illegitimate daughter Martha Sutton in around 1622, the daughter of his long-time concubine Elizabeth Tomlinson. These two Sutton marriages coupled with the evident wealth meant that until the arrival of Humble Ward the Wilmers were a most significant influence on the Sutton family and their various endeavours. 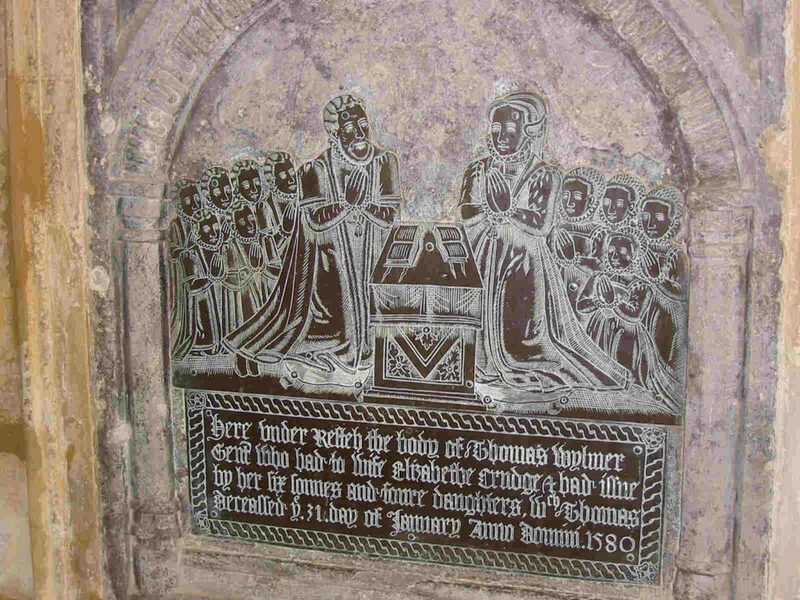 The brass plaque depicting the family of Thomas Wilmer the elder, at his death in 1580 stands to this day in Staverton Parish church. It shows the status already achieved by the Wilmers and perhaps indicates the ambition to come. By the 1620’s the Wilmers had been somewhat usurped in Dudley Castle by William Ward as bankrollers of the Sutton family. William Ward, jeweller to Charles I and wealthy goldsmith in London came to an agreement whereby his teenage son Humble Ward was to marry Frances daughter of Ferdinando Sutton, Lord Dudley’s heir. Ferdinando predeceased his father in 1621 and around 1627 the boy Humble Ward married the teenage Frances (bap 1611). With this development the dynastic ambition of Thomas Wilmer was essentially thwarted and he died in Oct 1628. St Edmunds records the burial of “old Thomas Wilmer” on 9 Oct 1628. He would have been 74. The youngest Thomas Wilmer, married to Martha Sutton, had three surviving children all daughters. If the couple had had a son it is possible that being simultaneously a grandson and a great nephew to Sir Edward, he could have been a more suitable heir than Humble Ward. The wealth of the Wards though was clearly the critical element and it clearly surpassed that of the Wilmers. Thomas Wilmer’s three daughters, Elizabeth, Anne and Martha, nonetheless, became the most eligible heiresses in Dudley, just as the town was entering the uncertainty and violence of the Civil War. Thomas Wilmer had a brother John Wilmer who also lived in Dudley and seems to have been in holy orders perhaps being the incumbent at All Saints Sedgley for a short time. He is recorded as officiating at one marriage in the St Edmunds Parish register.